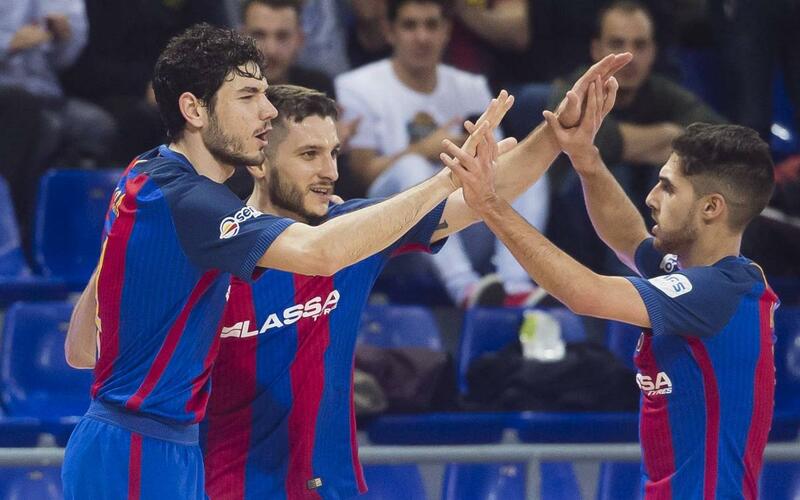 After the recent draw at Gran Canario, FC Barcelona Lassa Futsal got back to winning ways on Wednesday with a convincing 6-2 win over Pescados Rubén Burela at home. Barça looked to set the pace early on with a barrage on their opponents’ goal. Dyego, Ferrao, Tolrà and Adolfo all had shots on target but were unable to get off the mark. That quickly changed as Barça scored two in two minutes soon through Ferrao and Adolfo to give them their deserved lead. The visitors reduced the deficit to 2-1 on 16 minutes but Dyego helped restore Barça’s two-goal cushion minutes later. Joao made it 4-1 with the home, by this point, really putting on a show for the crowd, and showed no signs of settling for what they had. Ferrao scored his brace for 5-1, Iago Míguez made it 6-1 before a late consolation from the visitors late on (6-2).